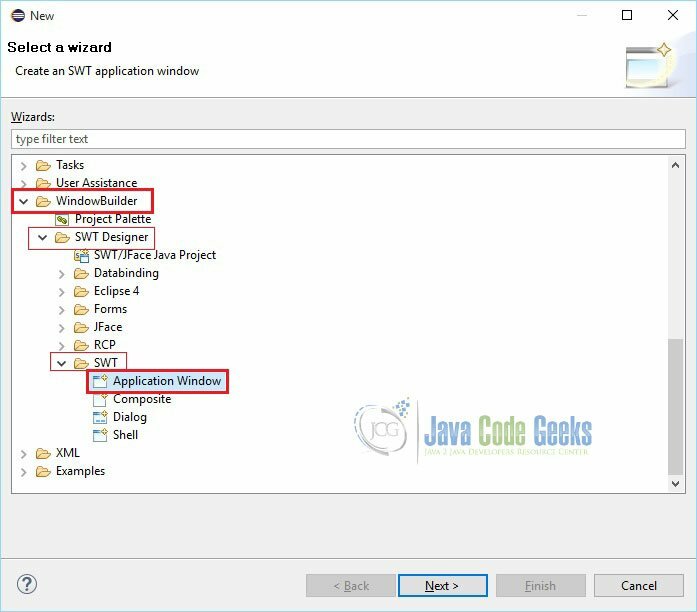 In this example, we will show you how to develop Java GUI Application using Eclipse WindowBuilder plug-in. 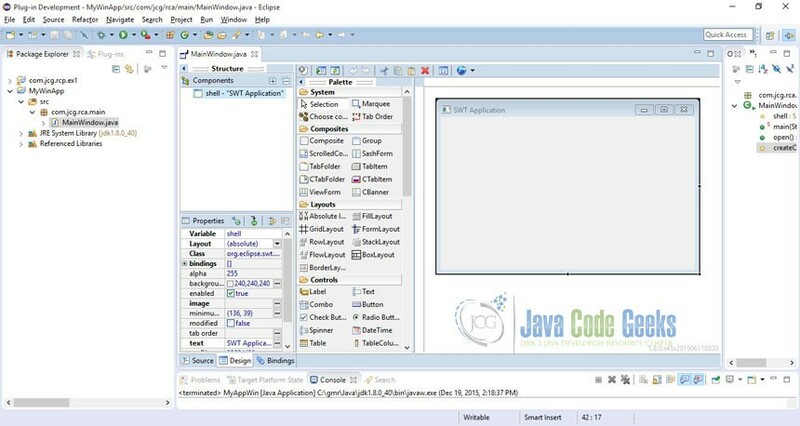 Eclipse WindowBuilder is a powerful and easy to use bi-directional Java GUI designer that makes it very easy to create Java GUI applications without spending a lot of time writing code to display simple forms. 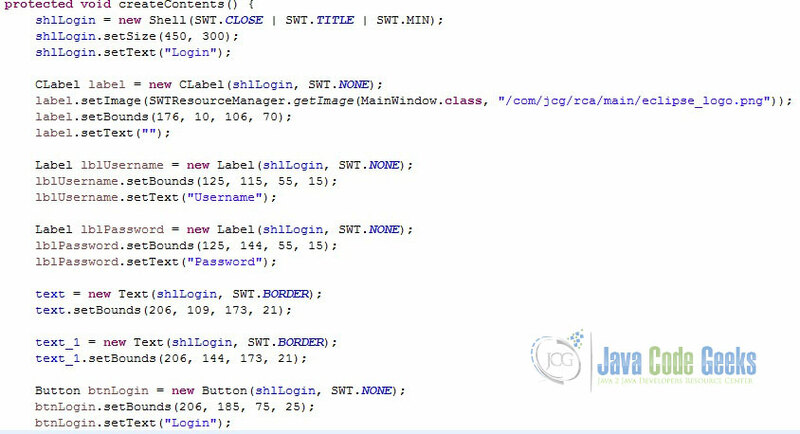 The bi-directional Java GUI designer means the developer can seamlessly move between a Drag n’ Drop designer and the generated code. 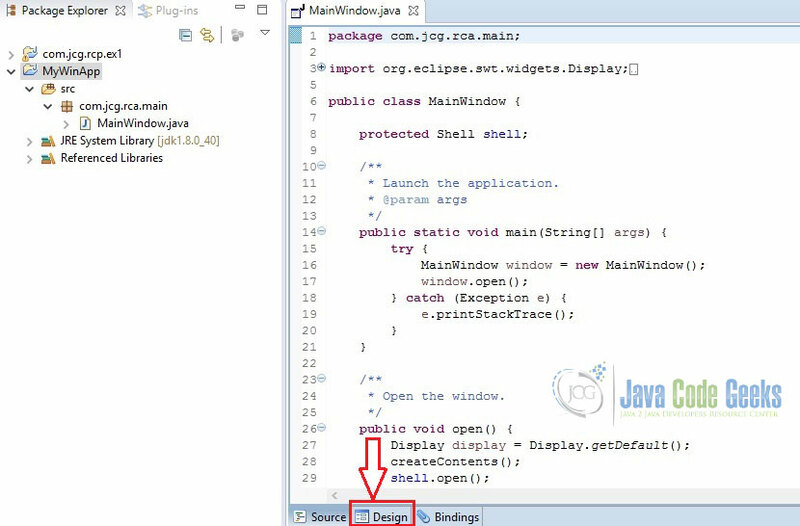 Using Eclipse WindowBuilder, the developer will enjoy creating Java GUI based applications. One can create complicated windows in minutes using WindowBuilder. WYSIWYG (What You See Is What You Get) layout tools in WindowBuilder are used to generate back-end java code by drag-and-drop of components to the container. Now, we will see how fast a simple Java GUI application can be created uisng Eclipse WindowsBuilder. WindowBuilder is built as a plug-in to Eclipse. 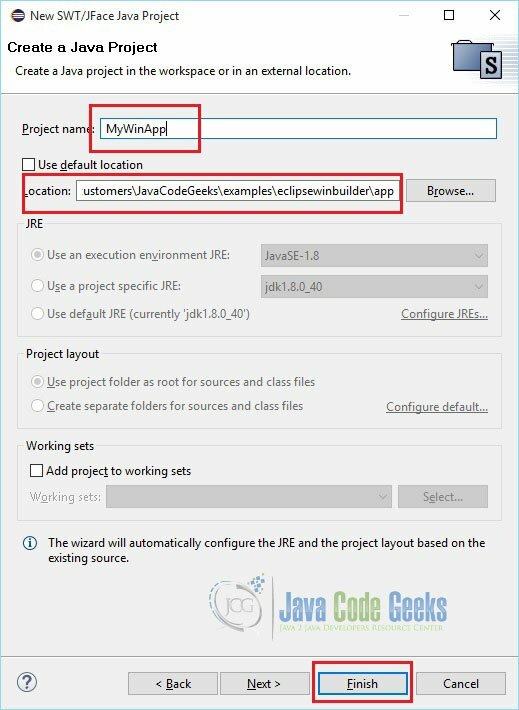 ‘Eclipse for RCP and RAP Developers’ is the default IDE bundled with ‘Windows Builder’ plug-in. 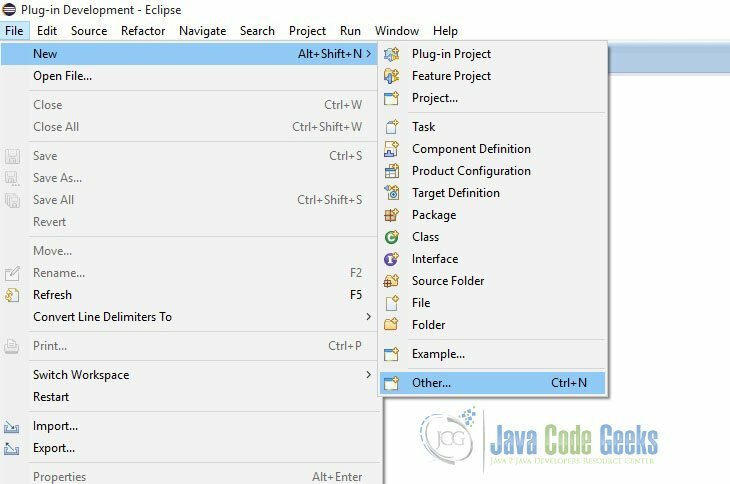 This IDE has a complete set of tools for developers who want to create Eclipse plug-ins, Rich Client Applications (RCA). Download ‘Eclipse for RCP and RAP Developers’ from here. Please refer the picture given below to identify the correct IDE. 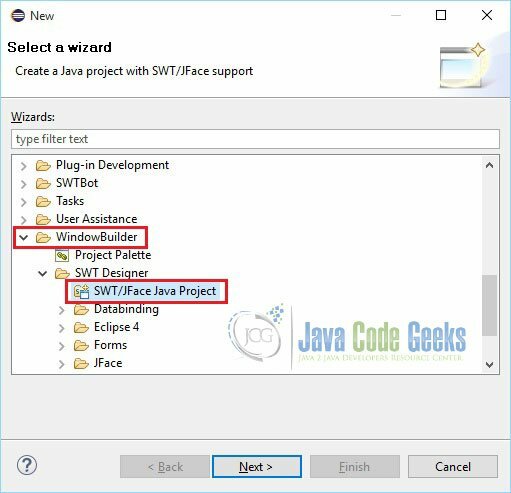 The reason for creating new project as ‘SWT/JFace Java Project’ is to have all the necessary JARs and native libraries included by the IDE itself. Otherwise, you have to add all these dependent JARs and native libraries on your own. 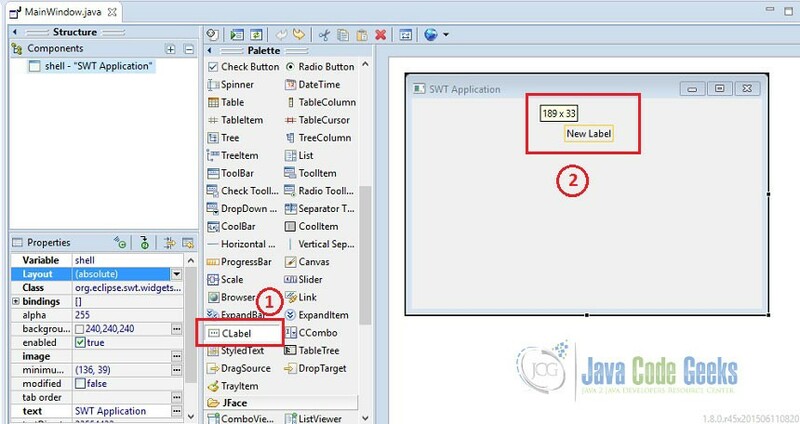 The Standard Widget Toolkit (SWT) is a graphical widget toolkit to be used with the Java platform. It provides a portable graphics API independent of the OS but that relies on the native widgets. JFace is a UI toolkit with classes for handling many common UI programming tasks. JFace is window-system-independent in both its API and implementation, and is designed to work with SWT without hiding it. JFace is a higher-level user interface toolkit that uses the raw SWT widgets to provide model-driven widgets, and to some extent some functionality that isn’t available in the Swing libraries, such as advanced editors, dialog boxes, and wizards. A basic window application has been created. Window Builder can be used to get your UI up and running quickly. Click ‘Design’ tab as shown below. Now, you will see the graphical representation (Design View) of your code. As we have not yet added any other elements, you will see a simple window popping-up as a result of the execution. Design View – the main visual layout area. Structure View – composed of the Component Tree and the Property Pane. Component Tree – shows the hierarchical relationship between all of the components. Property Pane – displays properties and events of the selected components. 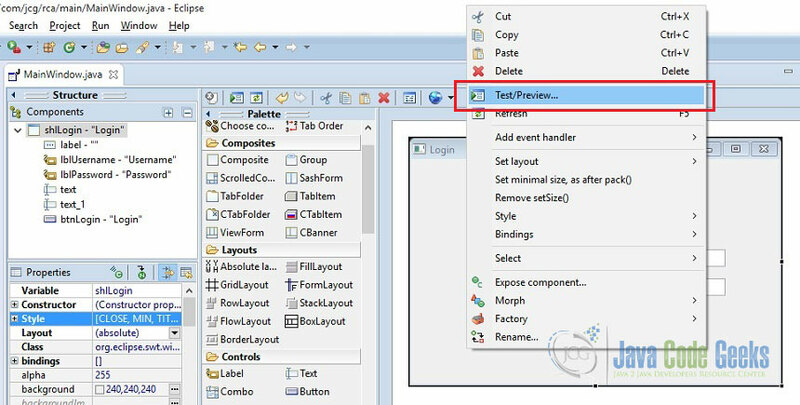 Palette – provides quick access to toolkit-specific components. Toolbar – provides access to commonly used commands. Context Menu – provides access to commonly used commands. Internationalization (i18n) / Localization – externalize component strings, create and manage resource bundles. Custom Composites & Panels – create custom, reusable components. Factories – create custom factory classes and methods. Visual Inheritance – create visual component hierarchies. Event Handling – add event handlers to your components. Menu Editing – visually create and edit menubars, menu items and popup menus. Morphing – convert one component type into another. Layouts are non-visible widgets used to give GUI windows a specific look and it helps to control the position and size of children in a Composite. 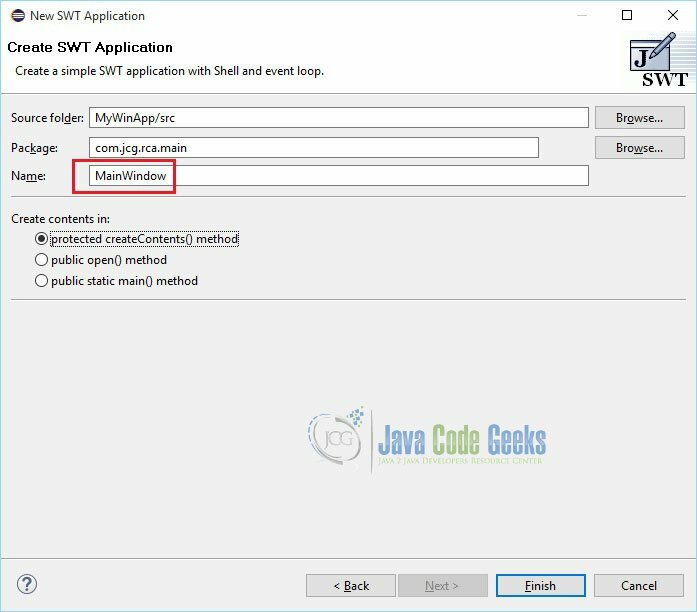 To make sure the GUI application developed in one environment works perfect in another platform, Java provides a system of portable layout managers. We use these layout managers to specify rules and constraints for the layout of the UI in a way that will be portable. Correctly positioned components that are independent of fonts, screen resolutions, and platform differences. Intelligent component placement for containers that are dynamically resized at runtime. Ease of translation. If a string increases in length after translation, the associated components stay properly aligned. SWT Designer supports the following layout managers. AbsoluteLayout AbsoluteLayout or Null Layout helps to specify the exact position, the width and the height of components. In a generic environment where the size of the screens may vary, this layout manager should be avoided. FillLayout FillLayout is the simplest layout class. It lays out controls in a single row or column, forcing them to be the same size. RowLayout Puts the widgets in rows or columns and allows you to control the layout with options, e.g., wrap, spacing, fill and so on. GridLayout Arranges widgets in a grid. FormLayout Arranges the widgets with the help of the associated attachments. StackLayout A StackLayout object is a layout manager for a container. It treats each component in the container as a card. Only one card is visible at a time, and the container acts as a stack of cards. BorderLayout BorderLayout lays out a container, arranging and resizing its components to fit in five regions: north, south, east, west, and center. Each region may contain no more than one component, and is identified by a corresponding constant: NORTH, SOUTH, EAST, WEST, and CENTER. BoxLayout BoxLayout allows multiple components to be laid out either vertically or horizontally. The components will not wrap so, for example, a vertical arrangement of components will stay vertically arranged when the frame is resized. Nesting multiple panels with different combinations of horizontal and vertical gives an effect similar to GridBagLayout, without the complexity. FlowLayout A flow layout arranges components in a left-to-right flow, much like lines of text in a paragraph. Flow layouts are typically used to arrange buttons in a panel. It will arrange buttons left to right until no more buttons fit on the same line. We will now design a new Login UI page using Window Builder. For this normal size screen, we will continue with the default (absolute) layout. We are going to have an image, two labels, one text field, one password field and a button on the screen. To display image use CLabel widget. CLabel supports aligned text and/or an image and different border styles. As shown below, click ‘CLabel’ once and keep your cursor on the screen and click. Now, the ‘CLabel’ is placed on the screen. Let us attach an image with ‘CLabel’. For this, you need to have an image in the folder where your ‘MainWindow’ source file is placed. For this example, I have used eclipse logo. Click on the ‘CLabel’ and then, in the ‘Properties’ window select ‘image’. You will now see the Image chooser window pops up. Select ‘Classpath resource’ option and navigate to the image file, select it and then click ‘OK’. Adjust the field bounds according to the size of the logo so that the image is visible on the screen. Similarly, add Labels, Text Fields and a Button. Finally the screen will be looking like the one shown below. To test this design, right click on the window and select ‘Test/Preview’ from the popup menu. Click ‘Source’ tab to see the code generated by the IDE. Single line of code in this was not written manually. Attach listener with the button to validate field entries. Refer the source code of the main file given below. 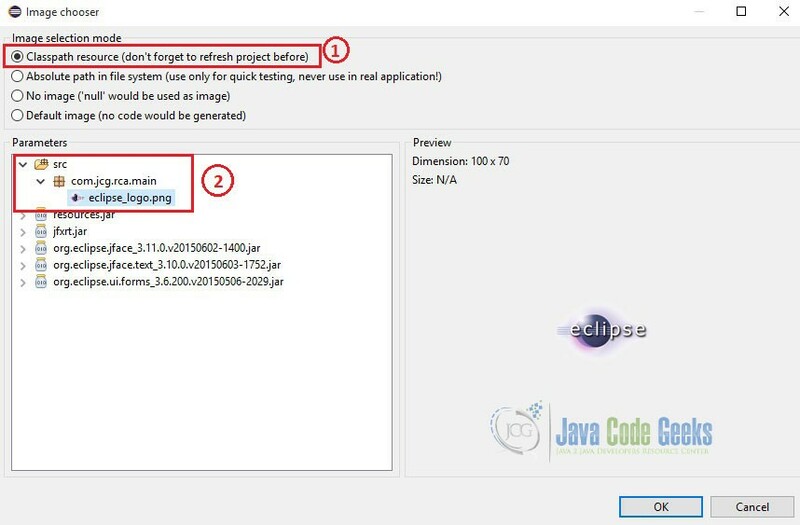 From this example, we learned how quickly a Java GUI application can be developed using Eclipse Window Builder. WindowBuilder Engine provides a rich API for creating UI designers. It supports Java-based UI frameworks such as Swing, SWT/RCP, eRCP, GWT etc. It also supports XML-based UI frameworks like XWT, GWT UiBinder, Android etc. This was a Tutorial about Eclipse Window Builder for GUI Creation. One big thing: I installed Eclipse Oxygen and then the WindowBuilder and SWT plugins. Following the tutorial I find that the shell – SWT Application in the design window is upside down as is the text. It previews OK though.